To Which Country Do These Flags Belong? The first flag is for American Samoa. It is a United States territory in the South Pacific. It is not a state of the union but it is under the control of the US State Department. The second flag is for the Vatican City. It is the smallest sovereign state in the world. It is located within Rome, Italy. These were the two flags that I was successful to answers during an “ice breaker” last Tuesday afternoon. As a reward I was given two Milky Way bars. It was a feat as I was the only one who knew the answers to both out of a hundred people. I remember my friend complaining about his daughter and how much she is costing him. He elaborated by saying how much he has spent everytime he pays for school transfer fees (she has been switching schools). He continued on how much he has to pay for new school uniforms, her new mobile phone, her clothers, her allowance and domestic airline tickets cancelled due to her ever changing mind. In my view children are never a cost to a parent. To some extent it is a duty of the parents to spend for their children until they are ready to be independent. You just don’t make babies and complain about how expensive they cost when they are growing up. On the other hand, some children are so obnoxious they really do not care of their parents. Call it downright selfishness. Last Sunday I really had a weird and bad dream. I think I was in Israel or something browsing in some of the sports clothing stores in the city centre. Suddenly, there was an explosion. It was another suicide bombing as I was told in my dream. The people in the stiore including me were panicking. We could not leave the store from the main door because the military or police may arrest us. I and a few other people were directed to leave the store through the back door. I did not know how long we walked but it seemed that after I left the store I was in a house of some sort. I’m not sure who owns it but I was there. Inside the house was this old man (who looked like Peter O’toole) who was in the corner of the lounge who seemed to be not bothered by the recent event. There was this other long blonde haired lady who was in a sort of recliner covered in a blanket. A few moments passed and there was another commotion from people outside the house. They say there will be another suicide bombing. There were two other people in the house who were looking outside from the main door. I said to them that I am not watching it and then BOOM and an abrupt dimming of the light from the outside. This time I began to cry. I think I said, “I can’t stand this any longer, I am leaving.” I went to the old guy and he did not care to look at me. The other lady in the recliner was sort of in a state of shock and her eyes were sparkling from the tears. I think I left the house. Then, someone called the old guy in the house. It was a Chinese military commander. The old guy informed them that the demonstrators and those against the Chinese have a meeting at a sort of a base in a cave. He said the not only the peasants are joining but the intellectuals and the businessmen are joining. The commander said that the demonstrators will not have a chance because the cave installation is actually a fortress and only one exit. When the people are inside the cave the military will close the exits and will apprehend and even punish (the most brutal meaning of the word) them and no one will escape. The old guy was in fact an informant–a spy. Good thing I remembered this dream. Good thing I had a tape recorder with me. I received a comment on my post regarding this Australian national facing the death penalty in Singapore due to trafficking 400 grams of heroin. He or she said that my comments were heartless and that it was just based on 500 words of news. My comment was based on many news reports including those on broadcast media (ie talk back radio, radio news and television news). If the news reports were biased or in favour or against the convicted man that is not my problem. I do have a fair share of financial problems but it did not push me to do criminal offences. Would it be right if all the criminals who were “forced” by financial problems be pardoned? I know that my comment is heartless but unfortunately that is the law of Singapore. I understand that Singapore is a developed democracy that gives a fair trial to all the accused under their laws. This person has been given the resources and time to defend his case. In fact his case has been decided by the city state’s High Court. Like what they say, “the law may be harsh but that is the law.” This is at least my view and I am entitled to my own opinion. On the other hand this man is the one paying for the crimes of the drugs supplier. Coming from a country with a terrible drug problem I know how bad the problem is. Using a “gentle hands,” “toucht feely” approach to solve the drug problem would never solve it. I still say the toughest punishment be given to all drug lords and traffickers! Rice, before it becomes white is brown rice (after removing the husk). A lot of experts have been saying that brown rice is healthier than white rice. 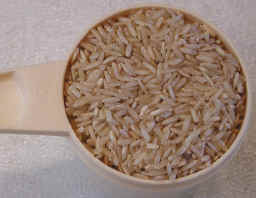 People have always eaten brown rice until the turn of the century when someone invented a way to remove the bran. When white rice was first introduced people got sick because of of the Vitamin B1 deficiency caused by white rice. Now white rice is fortified to solve this problem. Not all of us can start to eat brown rice for our next meal. Brown rice is a bit rough for our palates. The best thing to engage yourself in eating brown rice is to mix some brown rice with white rice until you can eat pure brown rice. I have classmates that irritate me when answering during lectures. Recently a lady classmate was asked why is internet usage high in Scandinavia . She answered, “because people there have nothing to do? !” What kind of answer is that?! Right then and there I wanted to throw water at her. She was in third year at the university. I was expecting a decent answer like people in Scandinavia have more PCs. More of my irritations in future posts. Someone also told me that why Europeans were more successful than Asians is that they have developed a system of planning. In Europe the weather or climate has always been cold so the Europeans were able to plan ahead for agriculture. In Asia the monsoon and weather patterns have always been unpredictable that is why this person claims that Asians did not developed planning systems immediately. Like other views this just another.